One of the first things you'll need to get is an Aggie Number when you first arrive. Banner will give you access to all your employee/student information, payroll, classes, etc. We will put in a request for keys when you first start through Enid or Brian in the main WATS office. Pick up key(s) once Enid or Brian says its ready over at Facilities (behind Aggie Ice Cream; see map). 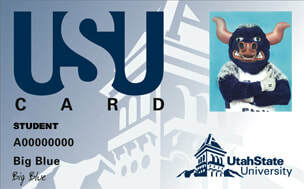 You can purchase a parking pass at http://parking.usu.edu/ (you’ll need your Aggie A#). Your dreaming if you think this gets you a parking pass close to the office. You need to be on a list for like 10 years and wait for some to die to get an orange or red pass. Your better off getting a disabled pass. You can get green passes. Better yet, biking will get you a real nice parking spot. A $15 fee and picture ID is required grad students should make sure their card reads "grad student" on it as this comes with benefits, such as a discount at the copy shop. You’ll need an A# and to set up a password on Banner (http://it.usu.edu/banner/) first. You can then set up an aggie mail account (a USU version of mail): https://aggiemail.usu.edu/ . We encourage people to record lots of videos to share with each other and post to YouTube. To do this you'll need a headset. Lab Headsets can be found in both the FHC and JQL storage. Do not remove these from the labs. If you need your own headset, just shout and we'll buy you one. To use, go to http://www.gotomeeting.com/online/ and log in, then either click Meet Now or Schedule a Meeting. If you just need a conference call line, try: as well as Free Conference Calls. If you want a QR Code, the ET-AL and/or FHC logos on the card, they can print those on the back and you will need to request this specifically after they send you proofs. The first page of the order form will ask for your contact details and billing information. The second page is where you submit the actual request for the card type you want, quantity and exactly what you want to show on your card. I suggest you use the same title as you use on your staff page. I suggest you use your own personal website or your staff page on http://etal.joewheaton.org/people for your website. You must obtain a Utah Driver's License, Voter Registration and Vehicle Registration. You must live in Utah for 12 continuous months. You must be declared financially independent. You must be a Citizen or Permanent Resident of the United States. For more information, visit this page. ​ Creative Commons Attribution 4.0 International License.